The First All Digital Film Featuring Performance Captured Actors Was? Volkswagen Sells More Of What Thing Than They Sell Cars? Performance capture, also called motion capture, is a type of movie magic wherein actors wear a special suit covered in markers or sensors (advanced performance capture also includes facial sensors too). A multi-camera recording rig is used to record the actor from multiple angles simultaneously and then the information captured from the actor’s performance is fed into a computer. This information, in turn, is used to partially or completely computer render the actor using computer graphics. The benefit of the method, over simply rendering the actor from scratch, is that body movements and expressions are more fluid and realistic. The character Gollum in the Lord of the Rings and Hobbit films was created using performance capture techniques, letting the authenticity of the performance and the brilliant acting of the captured actor, Andy Serkis, shine through. While many films use performance capture for some elements of the film, the first all-digital capture-based film was the 2004 holiday film, The Polar Express. Actors like Tom Hanks, Eddie Deezen, and Leslie Zemeckis were carefully digitized using extensive performance captures and then carefully inserted into the movie. 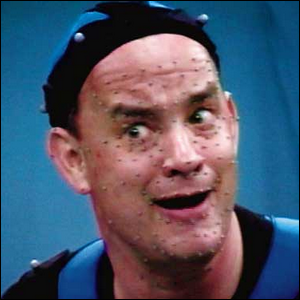 While some people did complain about the uncanny valley effect with some of the animation, the performance capture did an excellent job of transferring Tom Hanks’ energy into a digital world, and the film was a box office hit. Image courtesy of Warner Bros. Pictures, from The Polar Express behind-the-scenes bonus footage.